Summary: This route from Wasdale Head to Great Gable begins with an easy ascent to Sty Head on the Moses Trod path. 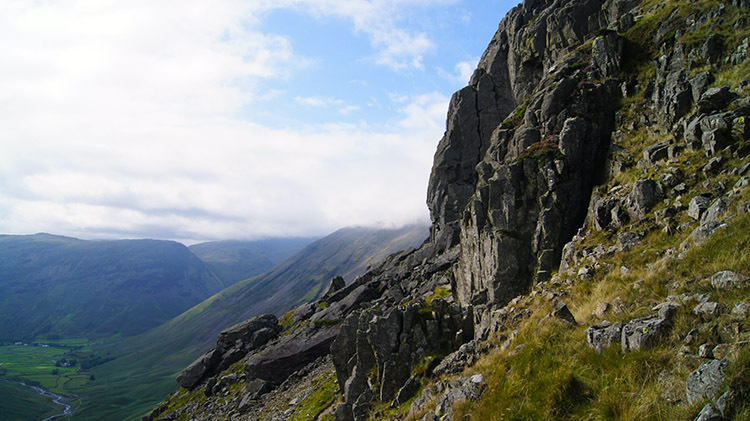 From Sty Head the going gets tougher with a traverse walk to the Great Napes on the airy Gable Traverse path which is sometimes difficult to follow as it climbs over boulder fields, scree slopes and jutting outcrops. 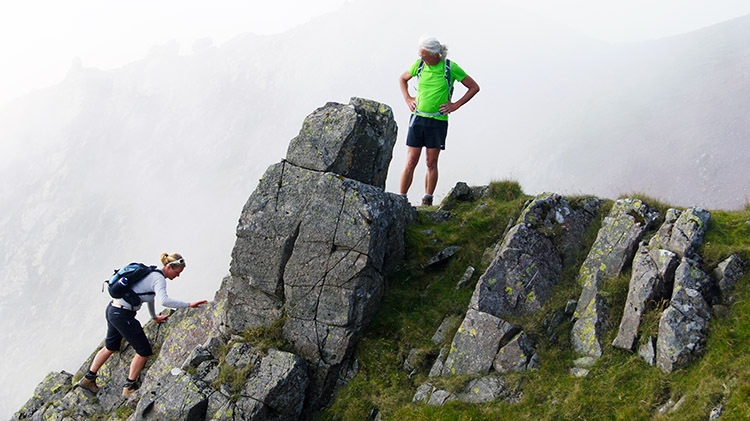 Easy does it will get you to Great Napes and then there is a further climb up the Little Hell Gate scree slope which runs down between White Napes and Great Napes to Westmorland Crags. 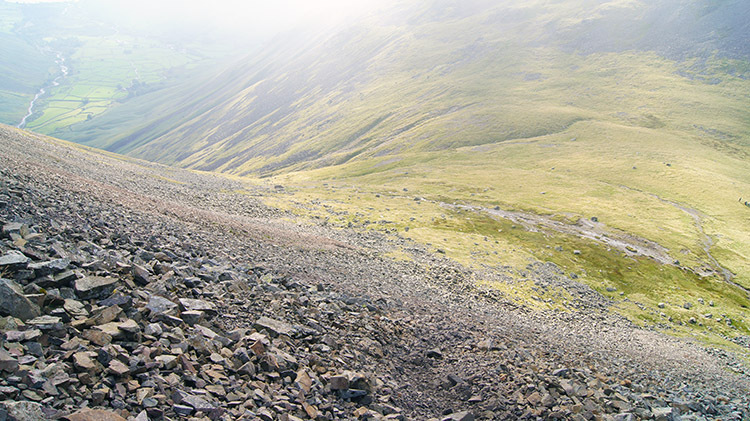 Rounding the crags leads to the summit of Great Gable. After summiting the way down to Beck Head requires the negotiating of a path down yet another scree slope before the descent eases to a more manageable walk back to the Moses Trod Path. It is a challenging walk but thoroughly fulfilling especially as the Great Napes are experienced at close hand. 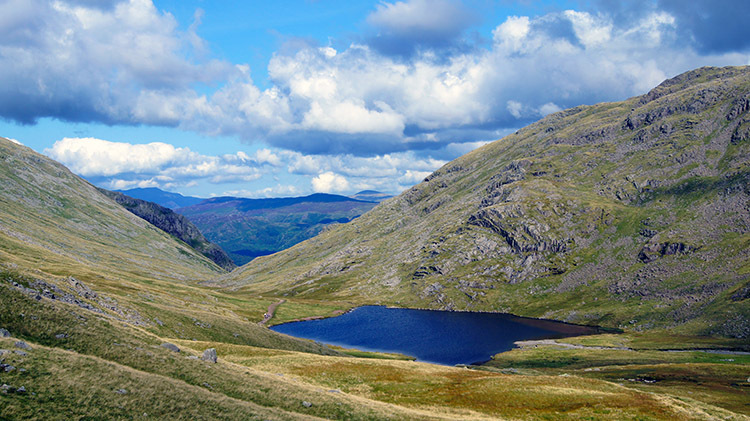 The Walk: I was staying in the Lake District for four days on a late summer walking break and had chosen four walks to some of my favourite Lakeland mountains using routes I had never walked before. 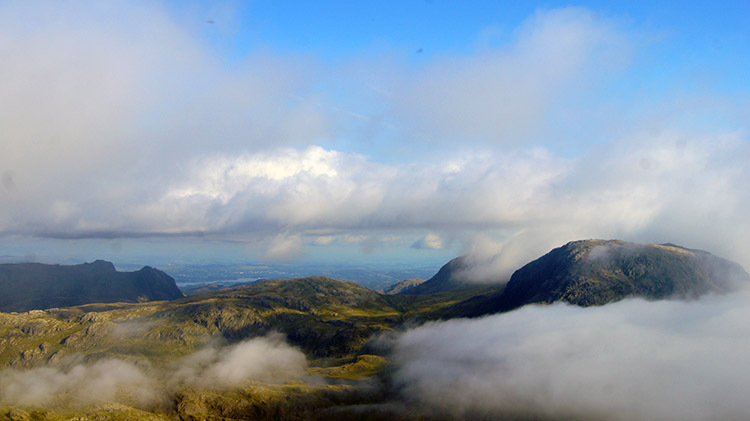 I had intentionally based myself in Eskdale so I could cover some of the western fells. Foremost in my mind was a return to Great Gable. On the occasions I had climbed the mountain before I had enviously looked down from the summit to the Great Napes and wishing I had explored them at close quarters. This time I resolved to do so. It was a gorgeous September day. I had been waiting for a spell of fine weather for weeks, watching the weather forecast from home every day during a changeable summer hoping for a good and reliable week with plenty of sunshine. I did not want to make the effort of travelling all the way from home to spend a few days in the mountains to find I was climbing them without seeing the full picture. Of course I wanted the best of conditions and the light to see the most spectacular sights available. The weather window I had desired had opened. I had left home earlier in the day and drove into Wasdale in early afternoon. The sunshine I had enjoyed in the drive west from Yorkshire continued to beat down. 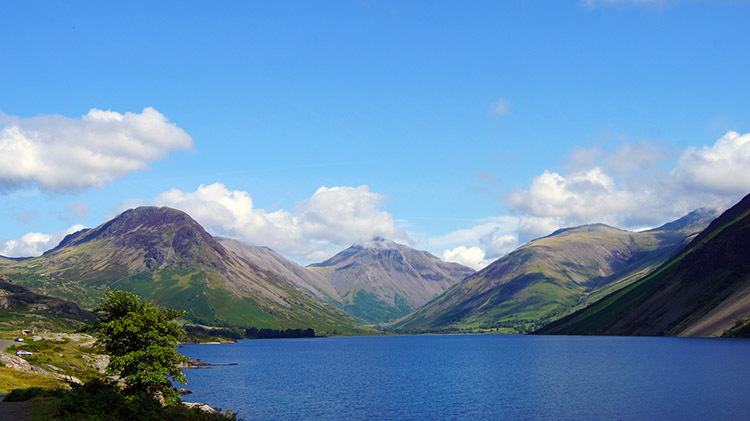 As I reached the north-west shoreline of Wast Water and looked along the length of the lake to some of the highest mountains in England I gawped in pleasurable wonder. I stopped the car and stepped out to look at the scene for as long as I could hold myself from the adventure of the walk. I could scarcely believe my luck. In the centre of my perfect picture rose Great Gable. Fluffy white clouds touching the summit cap before scooting off made the scene one of perfection and filled me with joy. 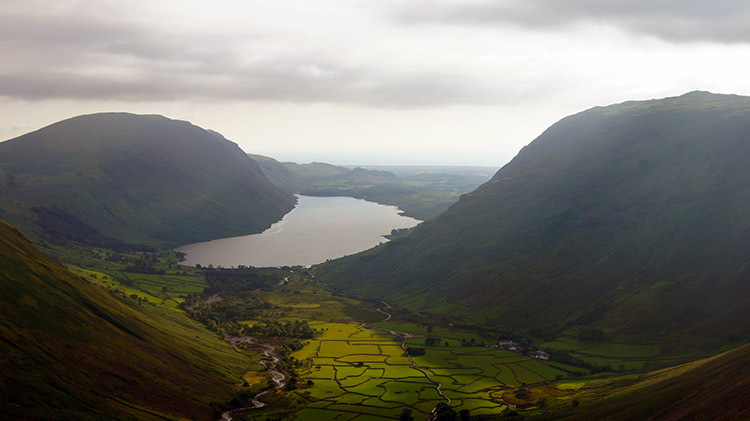 After drinking in the view as long as I could bear I got back in the car, drove to Wasdale Head car park, changed into my walking gear as quickly as I could and then set off walking towards Great Gable. I had an urgency to be on the mountain. I walked down the walled lane from the car park to the farmsteads at Burnthwaite with my eyes fixed on the mountains ahead of me. 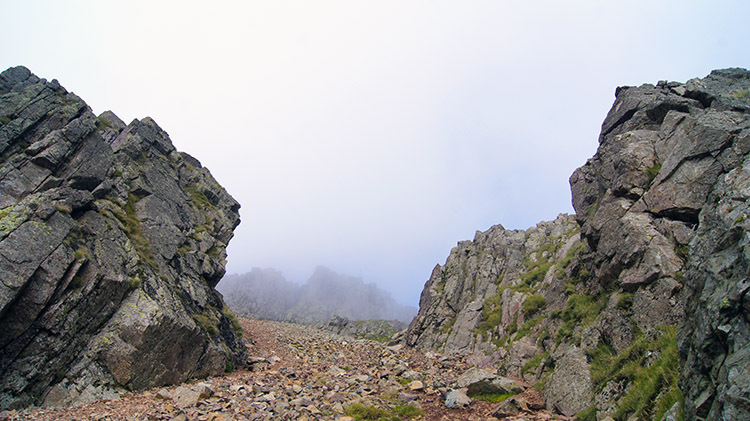 Great Gable took precedent and I looked for the paths I would be following up the mountain. But I was drawn to look across Lingmell Beck to the Scafell's too. 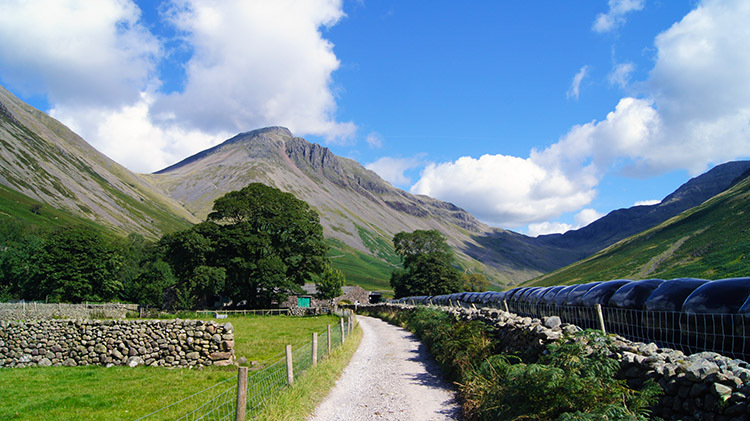 They were the goal for the next walk which was also to start from Wasdale Head. 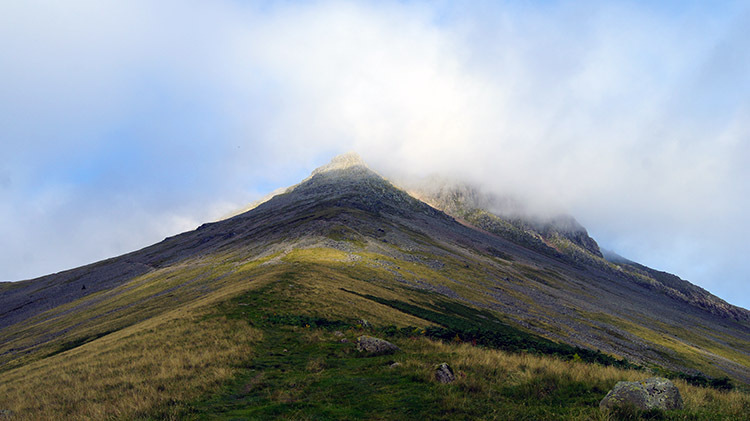 By returning my thoughts to the immediate activity I took more interest in the structure of Great Gable. As I headed east from Burnthwaite towards Moses Trod Path I started to make out the Napes. Not just the Great Napes but White Napes too and the intimidatingly titled Little Hell Gate scree slope which I would thread my way through. I was not intimidated. I was excited. 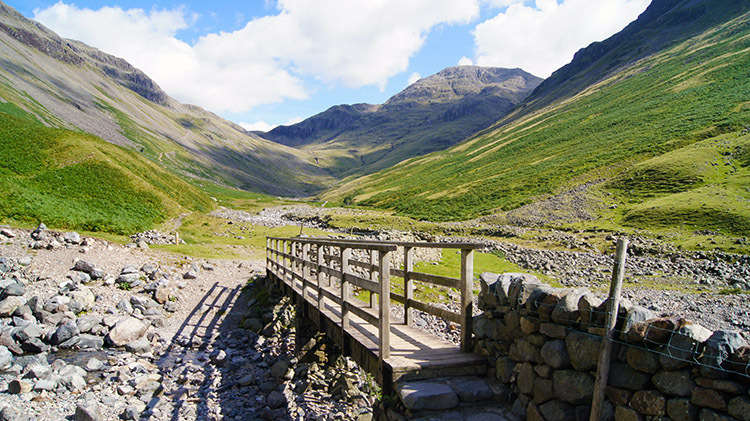 I crossed the footbridge spanning the dry bed of Gable Beck with a spring in my step. I had walked one mile to reach Gable Beck and in that time I had climbed over 50 metres and barely noticing I was going uphill. After crossing Gable Beck I knew I was going uphill. Though the increase in gradient was slight the character of the path and the terrain I was on created the marked change. Before the footbridge the path had been wide and indistinguishable. After the footbridge and at the junction of paths I was to walk too and from the mountain on they narrowed to single file. I kept to the right hand path, continuing walking due east on Moses Trod Path towards Sty Head. One minute I was walking on firm ground. 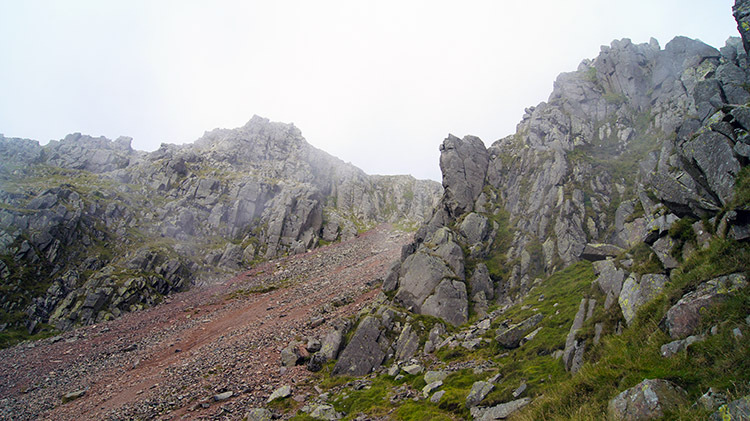 The next minute I was walking across sliding scree which had detached from the Napes and crags above me. Great Gable is an ever changing mountain. Every storm causes ruptures in the rocks and with each storm more scree is sent tumbling down the mountain. It is happening all the time though we seldom notice. And without noticing I had climbed over 300 further metres along Moses Trod past Bursting Knott and Toad How. I spied an old friend. Sty Head Tarn shimmered in the sunlight below me. While walking the length of Moses Trod Path I had been looking up to see if I could make out the Gable Traverse Path I was to follow from Sty Head. I had not spotted it, nor had I seen a walker on it. In fact in this most beautiful of late summer days I had not yet seen a walker at all. Not yet. At Sty Head lots of paths met and working out which one was Gable Traverse took a little trial and error. I could not see it part from the other paths but I knew which direction I had to take so I left the path and crossed a rock outcrop to the other side. With the added height and ideal view I found the path heading off in a line north-west. I soon realised that following Gable Traverse was not straightforward. In fact it is not a path at all but a series of options to take while crossing ground with the land to one side falling steeply away and on the other side walling you in. Rather than being a path it is a course meandering on a compass line to a point. That point is the bottom for Little Hell Gate and to reach it no walker will tread the exact same line. It is an imaginary path with lots of choices. Soon the path petered out at a scree slope below Kern Knotts. Individuals had made their own lines. 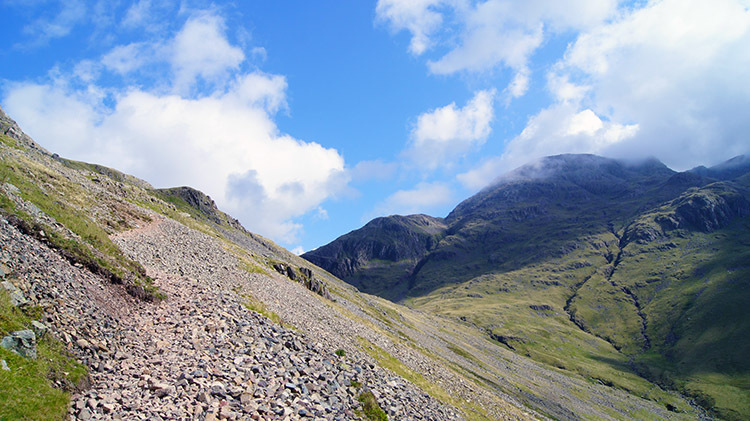 A series of parallel paths crossed the scree giving me a choice of which to take. Some paths led off the parallels as people had decided the one they had taken first was not as good as the one next to it. People had constantly changed their course as they went on. And then there were the boulder fields and fixed outcrops where the path disappeared altogether. Now the choice was harder. "Do I go down to that point and round that crag" or "Do I keep to this height line and scramble over that crag" were constant questions in the mind. "Do I go to the right or to the left of that large boulder" and "Do I hop over that series of rocks, just like the stepping stones across a river" were more questions to answer in an ad-hoc fashion. At one point where these questions were going through my mind I spotted two walkers coming down from the other direction. They were higher than me and provided my answer. I climbed towards them. They descended towards me. On meeting up we all agreed it was a great day to be on the mountain and great fun to be on the path. They pointed the way ahead for me. Likewise I pointed the way for them to go. Soon after meeting the two walkers I came to a substantial scree slope which would take some crossing. More parallel paths showed themselves and more intersections between the paths across the scree where people had changed their minds. This scree slope was the sibling of Little Hell Gate. While without a name it shared intimacy with the Great Napes. Little Hell Gate scree falls to west side of the Great Napes. This scree slope fell to the east side of the Great Napes. Once across it I knew I would be in the midst of the Napes. After crossing the scree slope on my chosen path I looked at the map and by double checking my GPS I confirmed I was stood near Napes Needle. he only thing is I could not spot it. I left Gable Traverse to explore amongst the Napes. I came to one needle and dismissed it. Then I came to another. And another. And another. 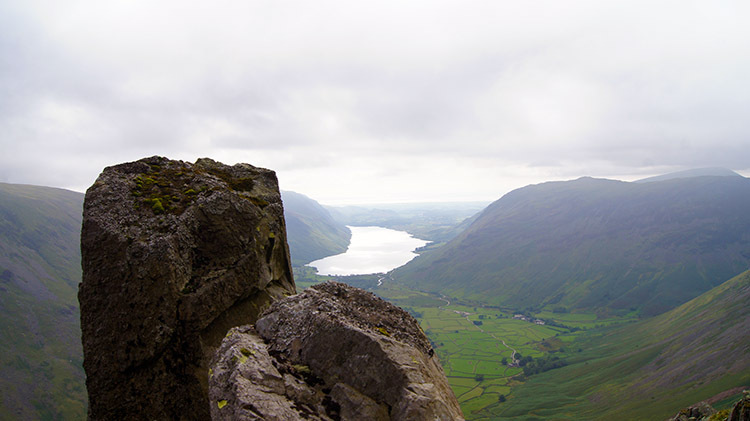 I even clambered up one needle and though it provided a great aspect view of Wast Water I knew it was not Napes Needle. Tired of scrambling and forlorn of wasted effort I gave up looking. I never did find Napes Needle. However, on resumption of following my walk I soon identified that just ahead of me was the bottom of Little Hell Gate. And on reaching the infamously titled scree slope I had completed Gable Traverse. I immediately tagged it as 'Lots of fun'. Climbing Little Hell Gate took a lot of effort. The name lived up to its billing. 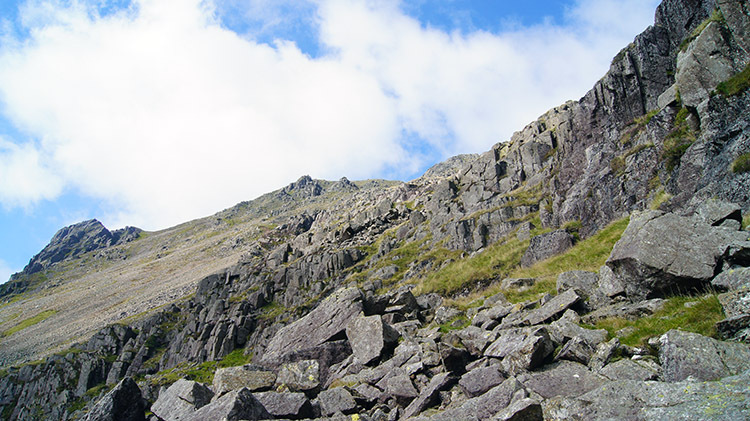 As with Lord's Rake on Scafell it is an inevitable hurdle which has to be taken. Unless you're one for scrambling and climbing up and over the outcrops and pinnacles of Great Napes and White Napes with ropes that is. Not me, I would stick to the scree. I tried to keep close to the edge of the scree in order to minimise slippage. There is nothing worse than wasted energy caused by a slide down the mountain in the very footsteps just taken. Sometimes I could step of the scree and on to a raised rock ledge. Even a half dozen steps on firm ground was a blessing before the inevitable of seeing the solid path terminate and to be forced back onto the scree. Sometimes on all fours I scrambled my way up the slope. It took some time, more than a little effort and when done I had a good sweat on. I qualified that Little Hell Gate merited its name. Caused to rest on the completion of the climb and slip and slide up Little Hell Gate afforded me a rest. At least the achievement allowed the forced rest to be enjoyed by taking in the great views on offer. Across the Lingmell gap I looked to Scafell Pike. 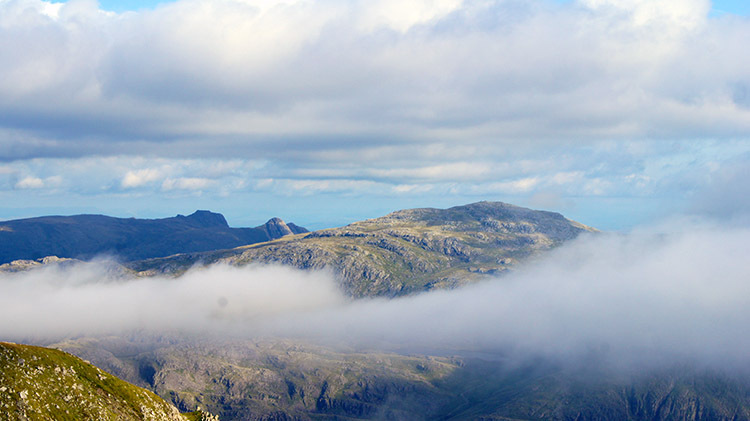 Clouds were scurrying across the lower slopes in a west to east direction and while they temporarily blanketed the valleys and outlier mountains the summit bouldered plateau of Scafell Pike remained in view. After my heartbeat returned to normal I stood up from the enforced break and focused my thoughts on getting myself to the summit of Great Gable. Westmorland Crags dominated the scene and a path heading directly towards the crags invited me on. The path swept around the left edge of Westmorland Crags to the summit but a man and a lady who had reached me as I rested chose to scramble up the edge of the crags instead. I stuck to the path and watched as the man led and the lady followed. It was clear he was the leader and she the pupil. I completed my circuit path around Westmorland Crags and on doing so I was delighted to see the summit cairn of Great Gable about 50 metres away. 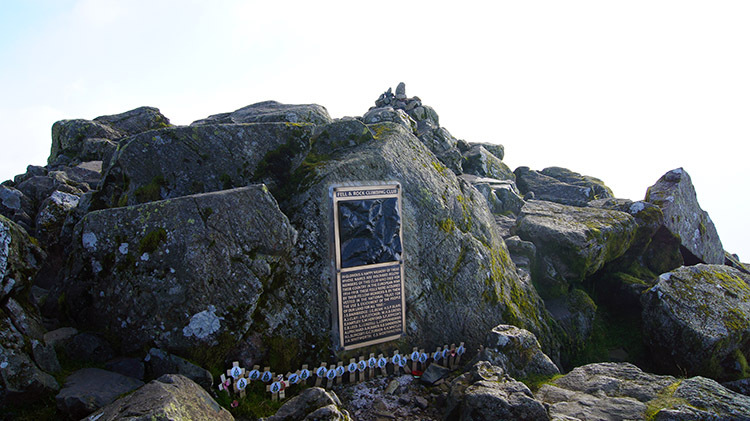 I headed straight for it across rock strewn land similar to that on Scafell and when at the cairn I took a moment to pay respect to lovers and companions of the mountains who lost theirs lives during the Great War at the Fell and Rock Club Memorial. After that I sat down to celebrate the achievement while taking refreshments. The couple were sat by the cairn too and the man pointed out all the mountain tops and valleys available in the view. I looked across to the Langdale Pikes, Allen Crags, Esk Pike, Bowfell, Great End, Ill Crag, Broad Crag, Scafell Pike and Scafell. That was just the view from east to south and with fluffy cloud sweeping across and dissipating as it did so made the scene a magic moving picture. After finishing my refreshments and when unable to take in any more of the summit view through unbridled ecstasy I set off to make the effort of getting off the mountain. And I knew it would take some considerable effort for the way off involved more scree. Lots of it. 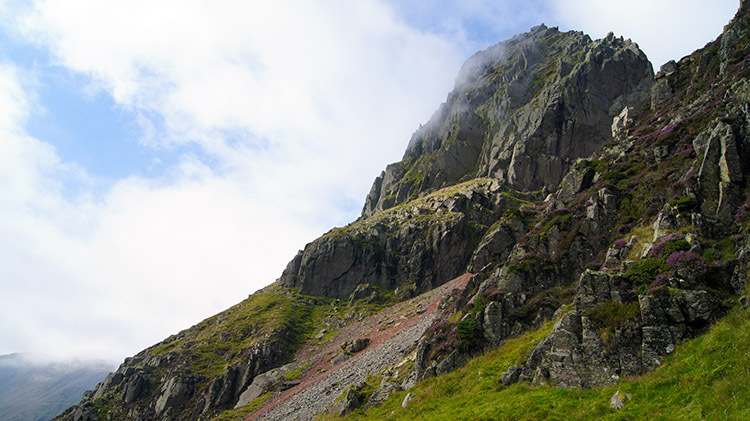 Wainwright said "All ways off the summit are paved with loose stones and continue so for most of the descent. 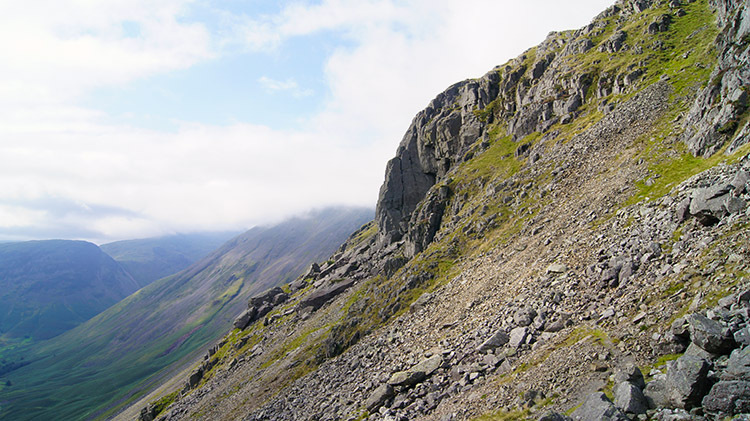 Allied to roughness is steepness, particularly on the Wasdale side and care is needed to avoid involuntary slips". Oh great, that was my way off. He added "In places, where scree-runners have bared the underlying ground, surfaces are slippery and unpleasant. Never descend Gable in a mad rush!". True enough I began my steady shuffle down the mountain by the north face to Beck Head. And yes, I was slipping a sliding as I went on patches of ground where scree had been extraordinarily disturbed. I was forced to take regular breaks as I descended as good strength in my legs had to be maintained in order to manage the inevitable slips without falling. At least when I did so I could enjoy the views ahead of me to the Ennerdale Valley. I imagined Coast to Coast walkers making their way through the valley as I had done so myself in both directions. My thoughts did not stray for long from the immediate situation though. Concentration and attention on where to place my feet was necessary for every step I took. And yet I slipped. Sometimes hands went to ground to stop a fall. It was hard work going downhill. In a weird kind of way the effort of clambering down a steep scree slope in the grace of a participant in a three-legged race was almost as much fun as scampering up the scree of Little Hell Gate on the other side of the mountain. Almost, but no quite. I always prefer gaining height and the views it provides than losing height and being closed in by more immediate surroundings. 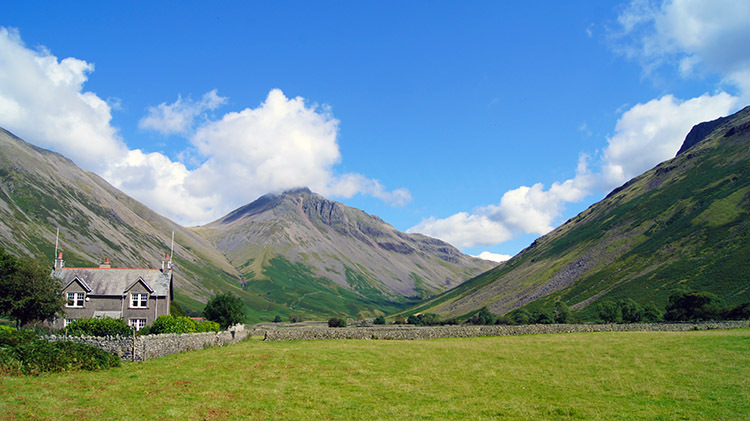 To my fortune though, after reaching Beck Head and turning at right angles to follow a south-west course on the line of Gable Beck I had the exquisite view of Wasdale Head and Wast Water directly in my eye-line. 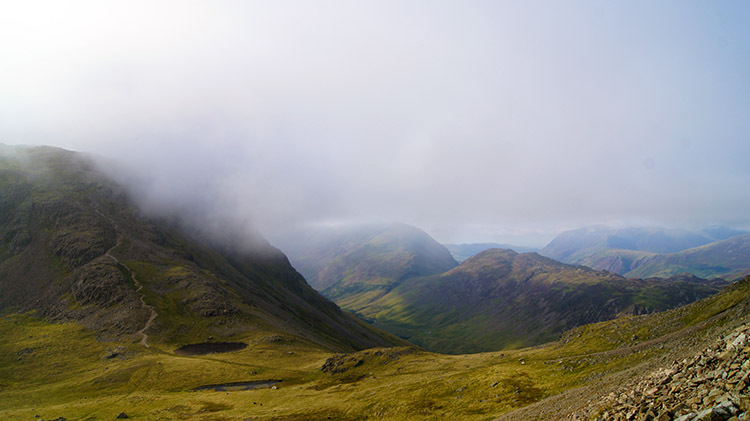 Being closed in by Great Gable to my left and Kirk Fell to my right created a natural funnel. Though the descent was still steep and on loose stones it was slightly less irksome than the severely steep descent from Great Gables top to Beck Head. I even took time to stop and look back to Great Gable which was towering over me once more. Clouds formed on top, obscuring views for those on the summit now. In good time as I could not walk with haste downhill without burning my calves and pressuring my knees I got to the bottom of the long path running parallel to Gable Beck. Despite the controlled descent the soles of my feet and my heels seemed to be on fire. The scrubbing and scraping arresting my descent had created plenty of friction. I stopped for five minutes beside the footbridge on the Moses Trod Path and took off my boots and socks to cool down. It worked a treat. Back to normal temperature I ambled back to Wasdale Head car park on the path I had walked earlier. I was thrilled. Now with the walk done I was left with a quandary. 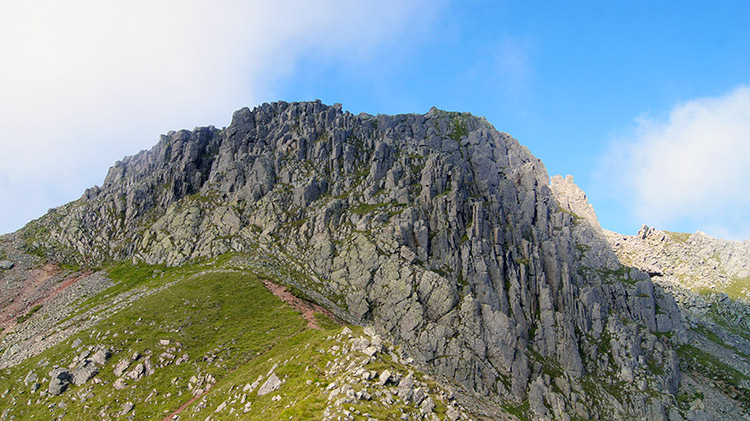 Which walk to Great Gable did I prefer? 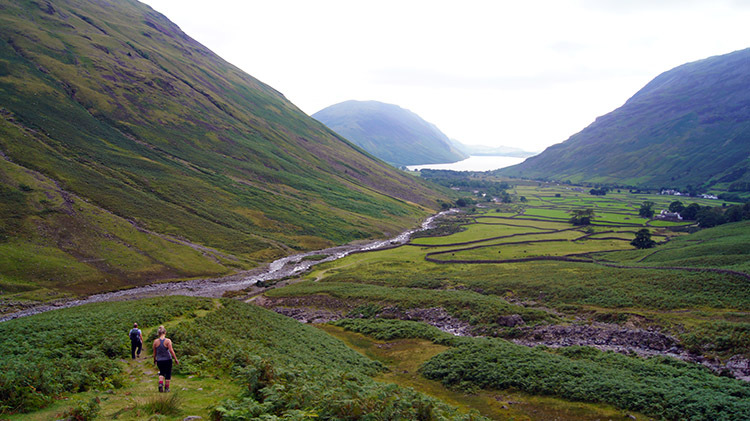 This one from Wasdale Head or my walk to Great Gable from Seathwaite. Both are stunning walks in their own right. 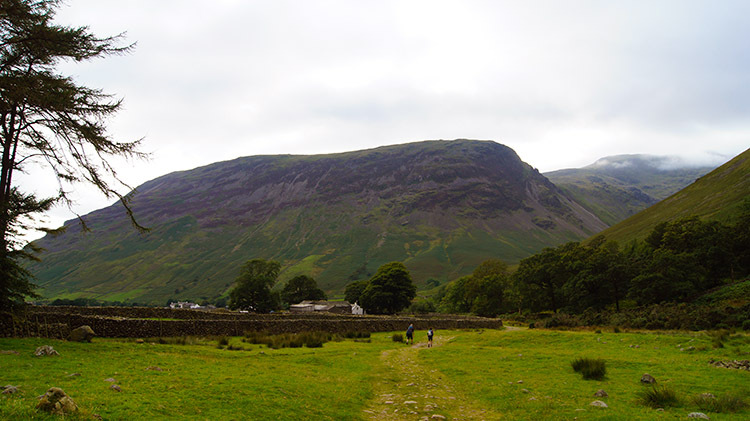 For the Great Napes there is Gable Crag. For Gable Beck there is Sourmilk Gill. For Little Hell Gate there is Windy Gap. It is a score draw.